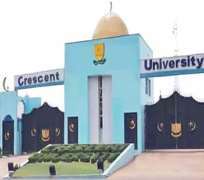 Authorities of Crescent University,Abeokuta have debunked rumours making the rounds that the institution's Master's programmes are not approved by the National Universities Commission (NUC),the regulatory body in Nigeria. In a release by the Public Relations Officer of the university,Idris Katib,the vice chancellor, Prof. Ibraheem Gbajabiamila confirmed that the National Universities Commission considered and approved the Master's programmes of Crescent University,Abeokuta since 1st July 2013 in a letter issued by the office of the Executive Secretary of the Commission with a reference number NUC/ES/312/VOL 1/135. Prof. Gbajabiamila stressed that sequel to this approval,the university had commenced its Master's degree programmes since 2013/2014 academic sessions and has since produced two sets graduates who are doing well in employment. He noted that a personality of His Excellency,Judge Bola Ajibola,the proprietor of the university would not bend the rules by allowing his university to run unapproved courses both at undergraduate and postgraduate levels. The vice chancellor recalled that one of the beneficiaries of Master's programme of the university,Adedeji Ajayi,who graduated from the Department of Mass Communication with a PhD grade is now working with the British Broadcasting Corporation (BBC) as Senior Journalist in charge of planning. Assuring members of the general public that the university would continue to turn out quality products,Prof. Gbajabiamila added that "several products of our university have also been appointed as managers in banking,insurance and other sectors of the Nigerian economy and even abroad". He however urged parents and prospective candidates to crosscheck with the office of the executive secretary of the NUC on the "status of our Master's programmes".